He should definitely debut next series. It must have been very exciting for him watching close matches from the bench. It is rare to open an official thread for someone who hasn't even debuted yet....but I think He is ready, He is ready to take on the world. a possible future keeper batsmen. Last edited by Rifat; December 16, 2012 at 04:42 PM..
All the best!!!! Have high hope. probably more than what i have for Nasir and Nur, my other favs young cubs. Congrats Rifat! Yes, he's our future. I hope to see him play in the next series inshAllah. When will we see him in action? But I dont like his fielding. so if he makes it to the team he should keep wicket and Mushy should do the fielding. If the Pakistan series does happen, then I say give him a chance to open with Tamim. Its time we get a guy who can open alongsides Tamim. Although we need him, is it too soon? Not everyone is like Tamim/Shakib/Nasir to handle the pressure at a young age. Perhaps, he can be in the 15, but not in the 11 right away. give him a shot i say, we gave nazimuddin enough chances it's time to try someone else and anamul is currently a squad member so he should be next in line. plus he is an amazing prospect, he has been on the radar since he was like 15 or so and he still is (4 or 5 years onwards), he's done well generally as he's moved up and through the system and atm it's a great time to blood a new talented youngster while the team is performing as a group because it's a great atmosphere to be apart of. All our bench openers (Imrul, Junaid, Nazimuddin) have had plenty of chances, and failed to cement a place in the team. I don't think there's any point in continuing trialing with those 3. It's time for a change. Someone worthy of partnering Tamim. MIght as well try him out, Nasir didn't turn out bad. After his courageous performance in high voltage BPL , he is ready . He has nerve and good technique. I am actually happy we didnt give him a go. He is a 20 year old kid who has picked primarily because of his good performance in BPL. Now he got a flavour of international cricket. Now he needs to go back and work hard on his game, do well in domestic cricket. If he continues to impress we should bring him in and give him a chance. Selectors must not make it so easy for youngsters to break into the side. I'm glad he was in the dressing room for the best 4 match stretch our team has had (I rank this higher than the NZ 4-0). His tears at the end of the loss, despite that he didnt contribute at all to any wins or losses showed that he has been inducted into the team in soul and spirit. Nazimuddin or whoever would have played deserved their chances. I'm glad everyone got a chance to prove himself, with only Riyad being successful. OK, maybe Jahirul deserves another chance at #3 before Ash gets recalled (you know its only a matter of time...I hope he finally is ready). But its time for Anamul to partner with Tamim at the top. Eventually I hope Anamul, Asif, and Mominul will form the bedrock of a solid and balanced top/middle order with Tamim, Mushy, and Shakib + Nasir. কালের কণ্ঠ : মাঠের কান্নাই বলে দিচ্ছে আপনার অনুভূতি। তার পরও একটু বলুন, ফাইনাল হারের পর কতটা খারাপ লেগেছে? প্রশ্ন : পাকিস্তান ২৩৬ করার পর মনে হচ্ছিল যে হয়ে যাবে? প্রশ্ন : বাংলাদেশ জাতীয় দলে প্রথম ডাক পাওয়ার সময় বেশির ভাগ ক্রিকেটারই দেখে যে দল বেশির ভাগ ম্যাচ হারে। আপনি না খেললেও দেখলেন, দল জিততে পারে। ভবিষ্যৎ পথচলায় এটি কতটা কাজে দেবে? প্রশ্ন : কোনো ম্যাচ খেলতে না পারায় হতাশা নিশ্চয়ই আছে? এনামুল : তা তো আছেই। খুব আশা ছিল, একটি ম্যাচ হলেও আমাকে খেলাবে। সেখানে দলকে জিতিয়ে দেব, পরদিন পত্রিকায় হেডিং হবে_বিজয়ের প্রথম আগমনে বাংলাদেশের জয়। সেটি হলো না। তবে দল অনেক অর্জন করেছে, তাতেও আমি খুব খুশি। কেবল ফাইনালটা যদি জিততে পারতাম! 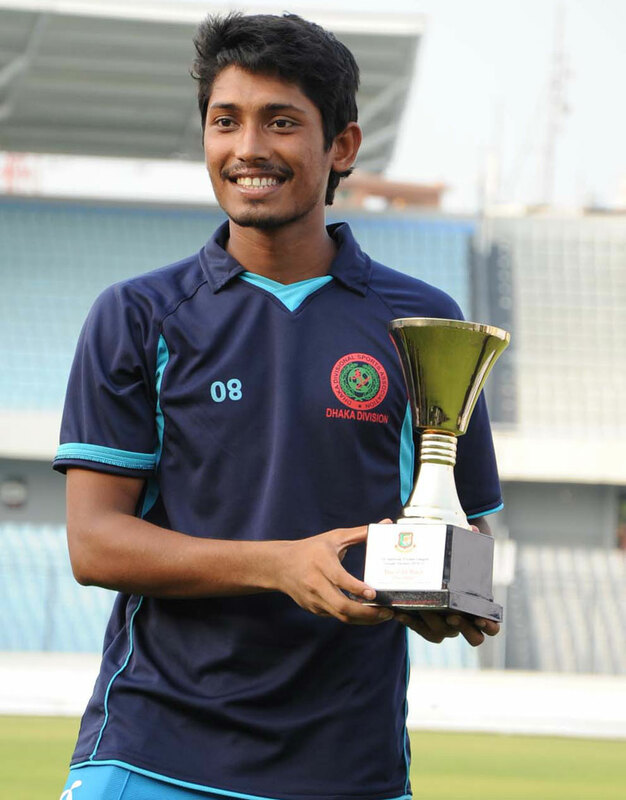 Anamul has had his exposure in BPL so I doubt he wont feel the extra pressure of intl cricket. May he be Tamim's rightfully deserved partner! Kaler Kontho: Your tears truly express how you felt. Please tell us, How did the loss in the final affect you? Anamul: what else can I say. I have Nothing more to say. Truly, I have nothing much to say. We were soo close to such a huge achievement, only two runs away. This grief will never go away. Even Though I was not in the starting XI, I was so involved in the game to an extent that I wanted the team to win from the bottom of my heart. When I was that The Trophy has been taken away from, my Heart could not Tolerate that; to me it was unacceptable. Thus, I couldn't control my emotions. Kaler Kontho: Did you ever think it was Possible to achieve the target after Pakistan scored 236? Anamul: In Every single Moment, I thought It was possible. Even when Shakib Bhai was out, I thought it was possible. The way Mashrafee Bhai was batting, felt it was still attainable. Riyad bhai was won us a match in the past, Why not Today? Last Time, Raz bhai couldn't connect with bat and ball last time, perhaps he will connect today. Anamul: All of us were very much optimistic. We thought that Afridi and Ajmal are the most dangerous bowlers. by then, their quota of 10 overs has been completed. When I saw Cheema in the last over I thought, We cannot be stopped; somehow, he will bowl a couple of bad balls. perhaps we will get an edge or the ball will reach the ropes somehow. Believe me, Even when Rajib bhai was on the crease, I thought He will hit it for four. Never ever before the loss occurred, We thought we would lose this match. Kaler Kontho: Whenever a new player is inducted into the Bangladesh National Team, they are very much used to see us losing. Even if you didn't play, You saw the team Winning. How much encouragement for future goals will you derive from the Teams' recent success? Anamul: I am very much inspired. Alongside the team, I feel that I cannot look back. If Tamim bhai scores four fifties, I have to score four fifties too. On top of that, I want to convert one of these fifties to a hundred. If Shakib bhai is man of the tournament, Why can't I achieve such accolades? Even if i didn't get a single game to play, I sense a motivation inside me. I saw right before my eyes, that It is possible to beat India and Sri Lanka. It is our misfortune that we couldn't beat Pakistan. I think to myself, We can also go to England and Austrralia and hand them defeats too. Truly we feel that we are moving on ahead. There is no time to look back. Kaler Kontho: Are you disappointed that you didn't feature in a game? Anamul: of course! I was very much hopeful that They would feature me in one game. In that same game, I would lead my team towards victory, and then the next day you shall see newspaper headlines: "Bijoy's first encounter brings a Win for Bangaldesh". It didn't happen. However, The team achieved a lot so I am very happy. Only if we had won the final match. There is no need to rush him to the final eleven, let him move towards that gradually... but the force is strong with this lad! Anamul: I am very much inspired. Alongside the team, I feel that I cannot look back. If Tamim bhai scores four fifties, I have to score four fifties too. On top of that, I want to convert one of these fifties to a hundred. If Shakib bhai is man of the tournament, Why can't I achieve such accolades? Smart Kid! I look forward to seeing him in DPL. He knows the needful for the hour! Liked his comments. Positive stuff, then again, all our boys are experts at "talking the talk". Looking forward to seeing this guy be the next best thing we produce. I always have bad feelings whenever we hype someone up a lot, maybe its just because we hype up just about everyone after having a few good innings. Here's to hoping I'm 100% wrong. I would like to see him make the squad for the T20 world cup, and than slowly work toward the other format depending on how he handles the pressure and how he performs in domestic cricket. Hmm too early to say anything about him. Hom was so much hyped in here....now where is he now? I think Anamul is one of our rare test match batting talents. I would like to see him make his debut in a test match, not in T20s. In fact, I want him to play as few T20s as possible at this stage of his career. It could mess up his technique. Remember we need a good test batsman much more urgently than a T20 slogger. From what I have seen in BPL, when Anamul tries to hit big, he usually gets the height, not the distance. Something he needs to work on. I would want him to be included in every Bangladesh squad for the next 1 year, but not in the playing XI. Let him grow by keeping him in the national set up. He should also be sent to all the overseas A team tours. InshaAllah, after one year we will have the perfect right handed partner for Tamim. I also feel that he has a bright future in test cricket judging by his performances in domestic/A team/Academy longer version matches.